welcome back to the 12 Days of Christmas *Day 4*! I am so excited to be featuring Concord and 9th on the blog today and just a little hint that you'll be seeing them again soon in a bonus video!!! Concord and 9th is truly one of my most favourite companies. I had the pleasure of meeting the owners, Greg and Angie, at Creativation this past year and they are fabulous!! The innovation in their stamps is incredible that I feel the need for a bonus video to show off their amazing stamps and dies from their latest release. In today's video, you can create cute and simple backgrounds for bulk cards. I ramble about the importance of production lines when bulk cardmaking and give lots of advice along the way to achieve the best results. Having that MISTI stamping tool sure comes in handy! How adorable are these plaid background stamps? I mentioned in my video that because I used a pigment black ink, things got a bit messy with the embossing powder but I kind of love the look it gave. Some areas are missing because I was cleaning up with a dry brush, some stray powder is stuck on the paper. But it gives off that traditional, vintage look of plaid. In order for the ribbon banner to pop, I created some of my very own silver and gold paper by embossing onto white cardstock directly. Layering up your dies is such a great way to make your dies look even more special and dimensional. If you don't want "dome shaped" Nuvo drops and you want them to flatten, let them dry from 30 minutes to an hour and place something on top (honestly these cards were just stacked on top of each other but they hadn't completely dried yet) and they flatten. It gives you a whole other look! Thank you Concord and 9th for sponsoring today's $25 GC giveaway! The banners add the perfect touch! Oh I love the Plaid.... it puts me in the mood to curl up on the couch with a mug of hot chocolate and a fun Christmas movie. Love the tips on mass production, thank you for sharing. I love this plaid background! I love this plaid stamp background. Thank you for sharing & this fun 12 days of Christmas event. These are great cards! I really like the plaid look. Thanks for sharing! 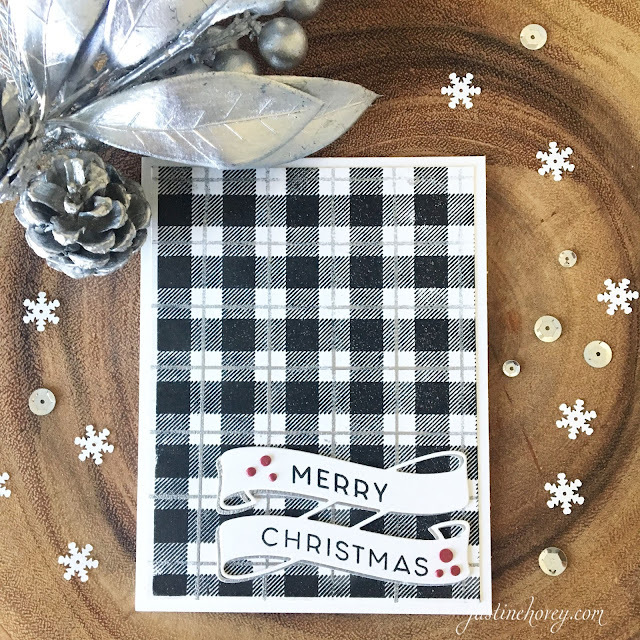 The love how a plaid stamp evokes feelings of being safe and cozy! Love your cards, Justine! TFS! Love tbe plaid background on the cards! Thanks for the great tutorial on using these stamps in the MISTI Justine. The cards are beautiful and as much as I love plaid, I am always intimidated when it comes to stamping it. TFS! Wow...so pretty...one would need patience for this!!! I love plaid!! Thank you, this stamp set is on my shopping list. I have tried stamping plaid patterns with solid stripe stamps and failed miserably, but these stamps would make it effortless. You cards are wonderful! Thank you for taking the time to share with us. This background stamp is sitting on my craft table waiting to get inked up! This is so pretty! I love the plaid stamp. Great plaid! Love the simple sparkle. You have real talent. Thanks for sharing this card. Loved it! Love all these plaids! Great cards! Love the versatile plaid stamp with extra lines - possibilities are endless! I also like the banner die, again I can see so many uses and the shape and size of it is so perfect. Thanks so much for sharing. Thanks for sharing this tutorial. I love these plaid cards and Concord and 9th products are amazing. I have been wanting a plaid stamp and have been looking at lines to design my own. This is so much easier and with the extra stamp you used to add heat embossing it is made that much better! I love the stamps and the cards. I really like that Merry Christmas. Thanks for sharing. Love Concord & 9th. These plaid stamps look like a lot of fun to use and create backgrounds! Such an easy way to make a really nice plaid! Love that plaid.. beautiful and simple cards! Great looking card and a great technique with the stamps. what a great idea - beautiful cards. I love the gorgeous simplicity of your cards!! Beautiful cards!! Love love love the plaid!! I really like the innovative products from Concord & 9th also. These cards are really neat! Thank you for sharing your simple but elegant ideas. I really like the plaid stamp. Beautiful plaid colors. WOW.. I didnt know you could wait so long between stamping with versamark to applying the embossing powder. Thanks to C&9 for the generous donation. I love these amazing stamps. The red plaid card is so festive! thanks for sharing great ideas on how to make many beautiful holiday cards easily. Love the cards! C&9 make wonderful stamps and I am excited to see your other projects!! Thank you for the great video tutorials!! Amazing plaids especially with the touch of silver or gold!! Wonderful plaid backgrounds! Loved the unevenness of the embossing powder on the background too! Fun twist! Gorgeous plaid backgrounds!! Love the little touches! Love the plaid. Thank you Concord & 9th for this amazing stamp. I LOVE plaid for Christmas cards! Thanks for sharing these cards. These cards are fabulous! Thanks for the close-up on the sentiment and the tip about layering it. Concord & 9th get me every time! I love what you did with this background stamp! You are so talented! Concord & 9th are pretty awesome, as well. Love the plaid backgrounds. Love you double the sentiments ....looks great with a gold and silver edge. I’ve never been a fan of plaid stamps before but this looked easy to do. I might be tempted, lol. Thanks for sharing. I've never used plaid paper before---but I love it! I LOVE this card design! So simple but really elegant with the traditional holiday colors. I was so inspired that I just purchased this plaid background stamp :) Thank you so much for sharing! Lovely cards and love the plaid, which is one of my favorite patterns! The touches of silver and gold really make the cards festive! How gorgeous ❤ I'm excited to be wearing my flannel shirts again, now that it's a little cooler outside. This plaid background stamp would make my cards match my shirts!! Love it so much! am so I am so in love with the Plaid stamp and your cards are totally amazing! I definitely need to add it to my stash! TFS! LOVE the plaid! And what a great ribbon banner die, too. Nice! 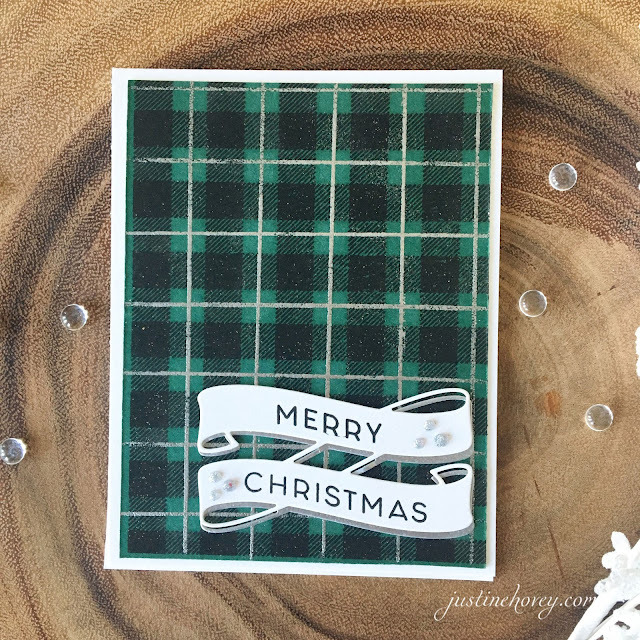 I need to get out a plaid stamp set I have and try some christmas backgrounds! Wow...I think I must get this for next years Christmas cards! My loving fans (family and friends, LOL) would be blown away! Love the plaid stamp, need to add it to my stash. Great cards..........love that you added the bit of bling with the gold and silver. 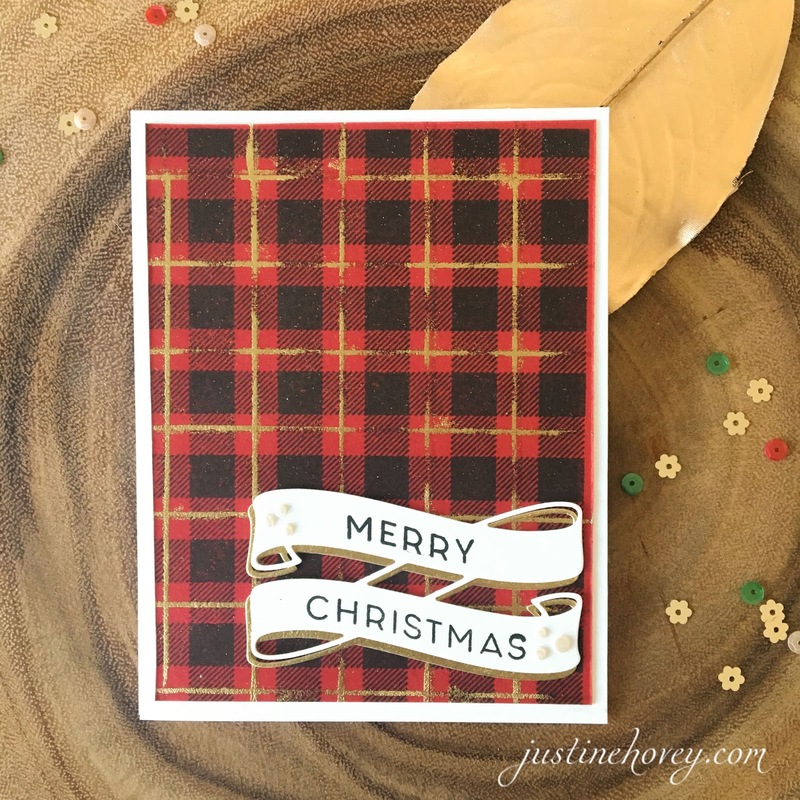 Plaid, plaid, plaid everywhere, great cards Justine! These cards are so elegant Justine. I'm in love with the plaid! Love love love! I have been looking for a good plaid stamp and think I have just found It! Your cards are fantastic. I love these! I think the black and white is my most favorite; I especially love the pop of red. ^__^ Thanks for sharing! I love the plaid and nothing says Christmas like plaid! I am thoroughly enjoying this series and looking forward to having the time to watch your previous years! These cards have such a traditional Christmas sort of appeal. I absolutely LOVE them! Wonderful cards. Love the colors. Beautiful cards. I love the plaid stamp. Love the cards. I really like plaid backgrounds. Love these plaid cards. I NEED this background stamp!!!! There's just something so comforting about plaid, it makes me feel happy! Love these fun stamps! Love your series. Thanks for doing this. What wonderful cozy plaid cards. Great plaid stamp. Thank you for sharing your design and the tips. Such a fun masculine card. I love the opportunities with this stamp. Love the cards in all colors! Love love love these cards! i am forever looking for new ideas to do bulk cards at Christmas time, these are beautiful! Absolutely full of awesomeness! This plaid stamp is a winner as are your cards! Love the banner die too! Concord and 9TH come out with some of the coolest stuff! Love this plaid stamp and the fact that they added the 2 skinny lines is awesome. I've already thought of at least 4 other ways to use it. And it would make great background for guy cards, those can be really tough! I don't usually like plaid but these cards are cool! I agree, I love the vintage look of your plaid. I love Concord & 9th & that plaid is awesome! The red plaid is gorgeous! Thanks for the great tip on Nuvo drops also. Love the flattened look! Beautiful cards! Love Concord and 9th. Beautiful! I love learning stamping techniques! I'm always amazed at the ingenuity of Concord and 9th. Justine, your talents and videos are wonderful! Always enjoy watching them and trying something new I have learned from you. I love these cards and the idea that they are easy to mass produce thanks for sharing. I love how these cards turned out! That plaid stamp is awesome. Thanks for sharing!! Love, love love your cards. Hoping to CASE them tomorrow or Saturday when my plaid stamp set arrives. I love concord and 9th products! I love Concord & 9th and have a few of their stamp sets! Simply delightful. Loving these sets! Love! I love everything plaid!! Just beautiful! My head is spinning thinking of all the color combos you could do and for all the different occasions. I have Halloween on the brain right now, so that came to me first, but I can see pastels for Easter and greens for St. Pats, and red and pinks for Valentines. Not to mention just using your friends and families fav colors for their birthday. Great for guy cards too! It's on my wish list for sure!!! Beautiful cards! Love the wavy banners and quick plaid backgrounds, the gold and silver details are so festive. Thanks for the mass producing tips too. Wow! Love the plaid!!! Beautiful cards!!! I love this stamp set! Thanks for the tip on the Nuvo drops, I do like the non domed look! Thank you and your sponsers for your giveaways! Thank so much - very helpful for creating plaid backgrounds. This black and white is gorgeous, never thought I would like those colors for a Christmas card. Thanks for all the tips too. LOVE the plaid backgrounds! Amazing!!! Lovely backgrounds! I also love the deep colors you used. Goodness, these are beauties! I love the rustic feel of them. I love the dimension of the banner. Also the plaid is a great idea. I love to use plaids for my backgrounds. plaid as the main ingredient is wonderful. Once again, a sensational series and stellar showcases of my favourite company's products! Your plaid backgrounds...swooning! Thank you for sharing tips and techniques! 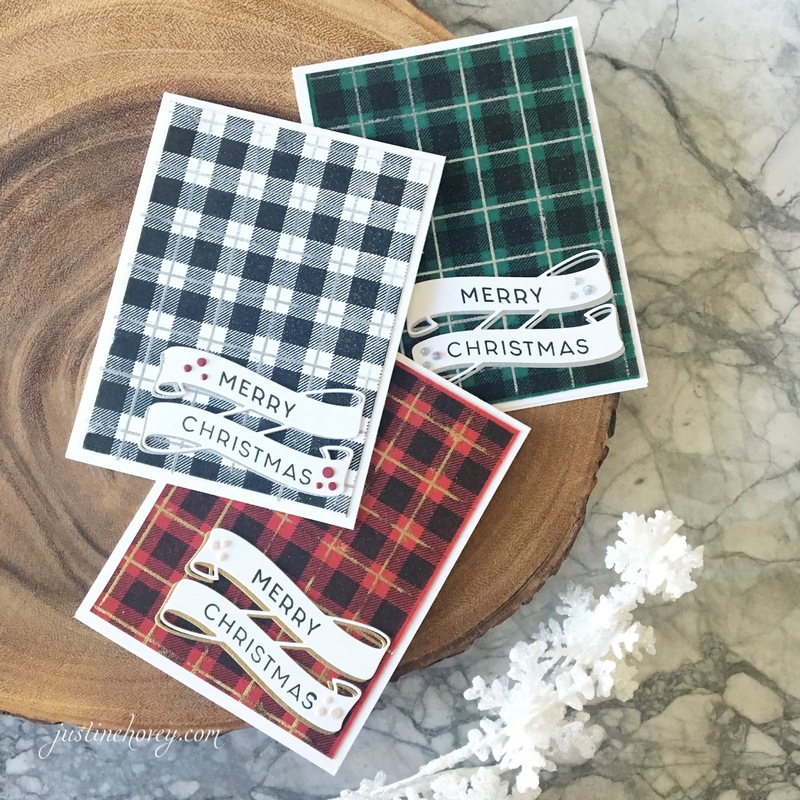 YOU have sparked my drive to start creating my Christmas cards...and I'm thrilled to say that the plaid stamp is on its way to me as I watch your creativity unfold! Wow, Concord and 9th are fast becoming my new favorite! I'll try to wait patiently for your other videos using their products! LOVE the plaid, ordered thebackground immediately! Nice Christmas cards! This type of plaid with the black always strikes me as being very "country." So stunning and very beautiful!! WOW!!! I love this stamp set! Oooh! Love the offset embossed piece behind the sentiment. Had no idea that plaid stamp existed. Love these plaid stamps. It makes beautiful cards. Thanks for the video. Gotta have a plaid stamp!!! Love the cards, as usual. Do many possibilities with plaid! I love the plaid stamp! Yes Concord and 9th was thinking when they put those two stripes together! Makes it so much faster! Mad about the plaid! Love these cards and the metallic accents. Great job! Great cards and fab backgrounds! The plaid background set would be wonderful for masculine cards. Really pretty cards! I like the plaid. Guessing they were fun to make too! They look so warm and cozy, just like Christmas! Plaid seems to fit right in with the festive holiday creations. I like the way you used this stamp...a little different from the outdoorsy look into think of when adding plaid to the look.Concord & 9th have such a nice new release. Looking forward to your bonus videos! I love your cards and the plaid background. I am so excited. I got my package today which includes the plaid background. I can’t wait till Sunday. The is my crafting day. I think that plaid stamp would be lots of fun to work with. I love the plaid backgrounds. So fun that you can totally customize the plaid with infinite possibilities. Love the cards, simple and easy but the plaid definitely makes it look like a holiday card! Love your cards! I have the plaid stamp, but I just have to get that banner die! Beautiful plaid, I love the imperfections!!!! Thank You!!! Those are so cute and don’t look super difficult. This background stamp is so cool just love it. Beautiful cards and so easy to make. Thanks for sharing! This background stamp is wonderful!!! To be able to create a perfect plaid with any colors you may want is a big "Wow!" And your cards are truly lovely, Justine! I love the background stamp that allows you to create the perfect plaid to go with any color you might need,. Oh that plaid background stamp reminds me of a warm blanket. What a great idea for a stamp! 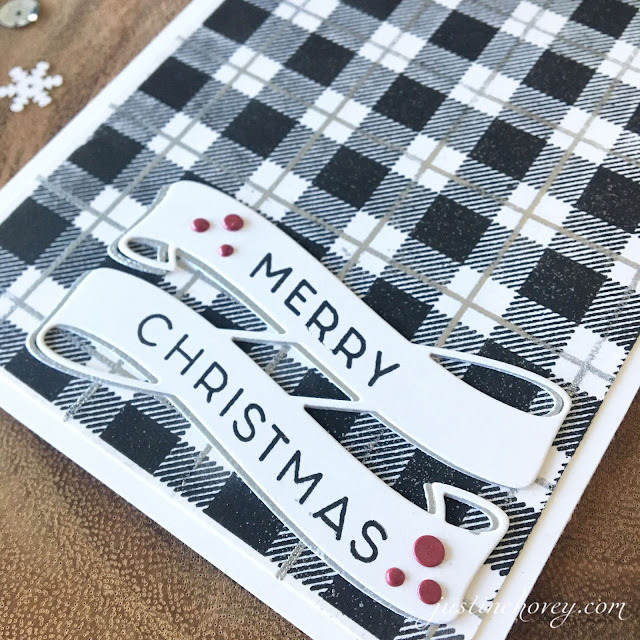 I like the super way to make plaid cards! Love these plaid cards! Really lovely. Gorgeous plaid cards! Love the different versions! I love this plaid! It makes me think of lumberjacks and that's always a good thing! The shiny pinstripes are awesome. Too cute, love the simplicity of them. Concord & 9th talk about creative, WOW! Lovely cards! Love the background stamp! I agree, they have some wonderfully innovative stamps! I just love this plaid...so cool how versatile it is. And I don't have anything like that banner: it's sure to be a staple! Thank you so much. Gorgeous cards! I can't wait to get my hands on this plaid set! These are gorgeous. Plaid gives such a warming feeling. And I have to agree with you about Concord & 9th. I recently got their layered wreath stamp set and dies. They are made so well. I’ll be using them for years to come. Love your cards, Justine!!! That plaid background is awesome!!!! And I love all of the sparkle that the embossing adds! Love the plaid stamp! And your color combos are great. Thanks for sharing. I never thought I would want a stamp for making my own plaid, but these are just too cute! Love Christmas in plaid. It makes for a cozy look and feel. Lovely cards! Got my stamps for the plaid - now to put them to use. These Christmas cards are beautiful! I would like to try my hand at making my own cards. I love this background stamp from Concord & 9TH, actually the whole release is wonderful. Great cards, love the colors you used with the embossing. I love stamps that will work for any occasion. Justine,really love the background stamp from Concord & 9th. Beautiful cards,the colors are awesome thanks for another wonderful video's. I love the look of the flattened nuvo drops!! I am loving the plaid look! That is amazing! At first glance I thought it was patterned paper. What fun cards! These cards are just beautiful! I never thought to flatten the nu of drops. I will certainly be trying that out. I just love Concord &9th. Their stamps look amazing! I loved these cards - the stamps are great and so user friendly!